At the climax of the Eve Wars, on December 24 of the year AC 195, the armies of the World Nation and White Fang met in a ferocious battle. World Nation leader Treize Khushrenada was slain, White Fang leader Zechs Merquise disappeared, and Earth was saved from destruction by the intervention of the five Gundam pilots. Having witnessed the consequences of war and hatred, the people of Earth and the space colonies put aside their differences and together founded a new world government. Under this newly-formed Earth Sphere Unified Nation, a year has passed in peace. The government and the populace have disarmed themselves, and almost every remaining mobile suit has been destroyed. 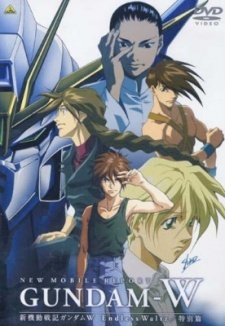 Deciding to follow suit, Gundam pilots Heero Yuy, Duo Maxwell, Trowa Barton, and Quatre Raberba Winner place their mighty mobile suits inside an asteroid and send them on a one-way voyage into the sun. But even as they bid their Gundams farewell, a new conflict is drawing near.